Try the free demo here. All your friends are storming the Horronym Fortress but Colonel Bouche left you to guard the supply depot. Disregarding orders you open the depot to find a gigantic, prototype mech! * INFILTRATE subterranean strongholds manned by cunning bipedal aliens and their mind-blasting hellions! * Recharging MegaNades, and an earth-shaking machine gun rip DESTRUCTIBLE environments to hand-drawn bits! * Dozens of CHALLENGE-ROOM style gameplay with a zoom function that let's in you close or zooms out to see all the action! 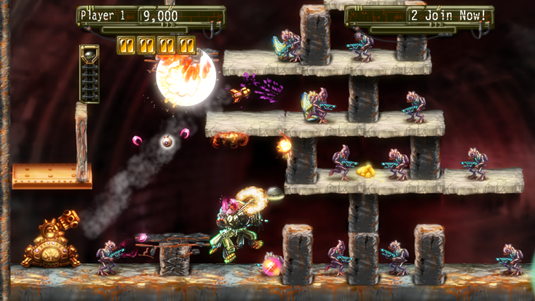 * 2-PLAYER COOP so you can share the alien-stomping, grenade tossing joy! * STEAM version has Leaderboards, Achievements, and Trading Cards! * Hand-drawn, SILKY-SMOOTH effect animations just like Mom used to make! "For 80 points, Explosionade is an absolute steal." 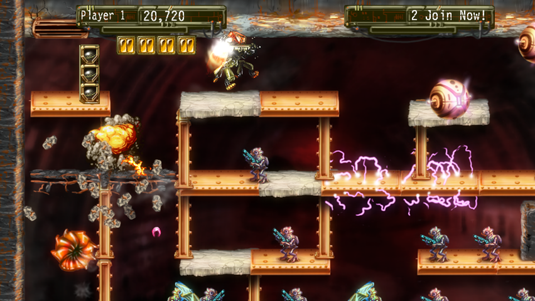 "The game, a cross between Metal Slug and Blaster Master's overworld levels, has rightly been obsessed over in blogs and forums." "You too can have this much fun running around a mutant-infested warehouse with an extremely powerful prototype mech..."
"Slick graphics, easy to get into, co-op play, funny dialogue." "I'm confident that anyone investing the asking price of one dollar will find that it's one of the wisest choices they've ever made." "Bosses are humongous in comparison to the rest of the enemies and take entire arsenals to bring down." "I heard a rumour (which I started) that Mommy’s Best Games is able to provide these quality sprites by eating live scorpions they find outside exclusively and passing those savings onto you, the consumer." "Oh, did I mention that you look like a character from Tim and Eric Awesome Show?" "The attention to detail is first rate, not just because of the exceptional hand-drawn graphics, but because of the amazing variety. " "Explosionade is a rare Indie game that is so good, it probably should’ve been a full Xbox Live release." "This is my absolute favorite Xbox Live Indie Game. Explosionade is simply a blast to play. I would pay $10 for it." Google Translate says "When life hands you explosions. Make explosions!" 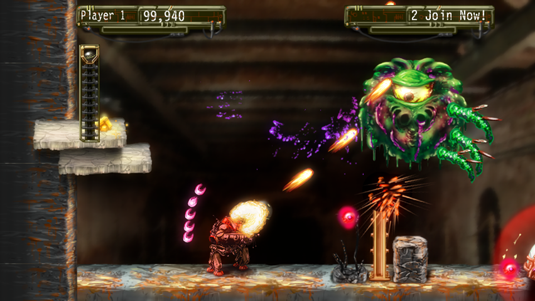 Xbox Live Indie Game Of The Week: Drink Your Explosionade! 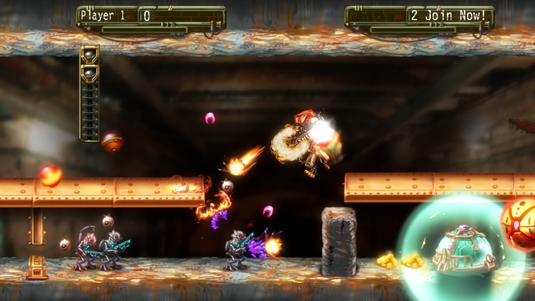 "If you crave big guns, huge explosions and twisted alien enemies, you need look no further than Mommy’s Best Games. " 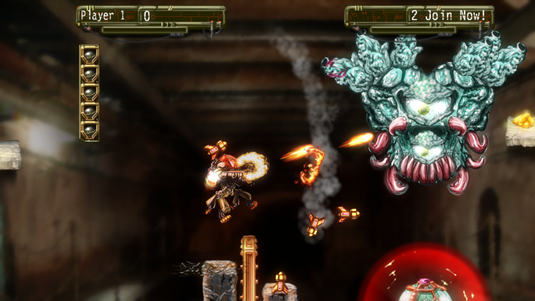 "The graphics and sprites are all wonderfully hand drawn, and there’s a great level of feedback when you shoot enemies which makes killing them satisfying." "Even the smallest enemy soldier has a lot of personality thanks to the little details in his armor and animations as he runs for cover from an explosion." 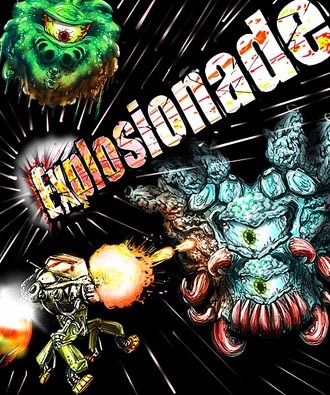 "Explosionade is an action packed, 40+ level exercise in jumping and shooting that reminded me of the NES classic Blaster Master." "You can tell just by watching the game play out that each animation was carefully created, and shown lots of love." "Your character feels like he's taken all these powers that would have stood on their own in any other 2D game and combined them to make one badass mech." "Making defensive tools just as fun as offensive ones seems to be a common trait for Mommy's Best Games." "Great graphics and sounds, and the gameplay is good fun." "With forty levels chock full of creatures that need killing, it’s a fantastic value at a buck." "MBG packed a lot of game into this package..."
Check out the development log to get a peak behind the scenes!